Attend any good meetings lately? Make the next one you lead a great one. 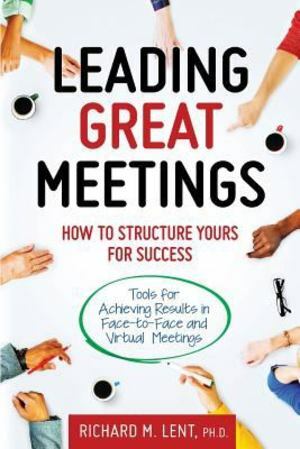 Leading Great Meetings: How to Structure Yours for Success shows how to plan and run more effective meetings by changing their structure. This book's recommendations differ from those that rely on adopting rules or changing behavior. Such methods may fail in the heat of discussion, but the right meeting structure helps people meet productively without having to remember how to behave. Leading Great Meetings can help you with board, team and other meetings of any size. It explains 12 choices and 32 tools for creating effective structures in any setting. You select choices and tools relevant to your situation. Also included are stories, examples, and even "blueprints," that show a structural approach in action. There is also a chapter dedicated to effective structures for virtual meetings. Finally, there are recommendations for what to do under pressure when there is little time to prepare. Some common meeting challenges you can address through structure include: Poor commitment to decisions. Running over time. Difficult, disrespectful discussion. Presentations that overwhelm participation. Keeping everyone engaged. Ineffective virtual meetings. Start running more productive meetings beginning with your next one.